Flour tortillas. Oh soft, tender goodness. Oh light, delicate, bready warmth. Oh perfect holder of all things edible: fajitas; tacos; Greek chicken; Nutella; leftover casserole with sour cream (don't diss it 'til you try it); banana, with peanut butter and honey; and even (lightning, please don't strike me)... hot dogs with Cheez Whiz. Oh flour tortillas, how I love thee. But you are the bane of my cooking skills. I cannot count the number of times I have felt like an utter failure because you turned out crispy, or greasy, or thick and doughy, or flavorless, or gummy, or dry. Yes, dear friends, after literally a decade of dashed hopes and failed attempts, in the twilight of September 8th, 2010, I made a perfect flour tortilla. I thought it was a fluke, so I tried it again on October 12, 2010 and was stricken by my repeated success. Could it happen a third time? This morning: yes!! Tender, light, flavorful, perfectly browned, and freezable! (I've frozen them after rolling both before and after cooking: they taste about the same, with a slight preference for freezing raw). You see, for 10 years I thought it was about the perfect recipe. I'm sure the recipe has a lot to do with it, but I'm learning it's more about technique. Here are 5 tips I learned through failed attempt after failed attempt. #2. By all means, use nearly boiling water. When recipes say "warm water," it does no good unless the fat is melted, and the way to do that is with nearly boiling water. You're not killing yeast here, so get it as hot as you can. I microwave mine for 3 minutes (old microwave). #3. When it says "knead five minutes," they actually mean it. There is a qualitative difference between tortilla dough kneaded "until combined and smooth," and tortilla dough kneaded for a full five minutes. Don't skimp on the kneading. (I use my KitchenAid with the dough hook and love the results, but I've successfully done it by hand before). #5. Use medium heat! Your tortillas will be crispy and black before they're cooked if you use a high heat. Be kind to your tortillas, and use medium heat. Don't use Crisco. Use lard. Get the water almost or actually boiling. Knead a full five minutes. Roll them as thinly as possible. Use medium / medium-high heat. Now, here's how you know when you've mastered it: your tortilla will bubble. If it doesn't bubble (and the first one on the skillet rarely does), it'll still taste okay, but you've not yet reached the pinnacle of tortilla perfection. I know, because my tortillas never bubbled. And then when I tried the 5 above tips (through trial and error), I thought I'd done something wrong because my tortilla was exploding in front of my eyes. You, too, can make a perfect homemade flour tortilla. Now I know you'll be wanting a recipe, and I can say... I've got three or four recipes that are all pretty good. The technique is what matters. But, you've got to start with some recipe, so the one I consistently use nowadays is translated and adapted from Blanca Díaz's magnificent how-to video on YouTube. If you've never made tortillas, watch the video two or three times (and cry when your first attempt doesn't turn out like hers... and then call everyone you know and rejoice on the day when you have mastered it). 1. Place the flour in a bowl. 2. Add the salt, baking powder, and fat without stirring. 3. Little by little, pour the very hot water over the ingredients and mix them with your hands (or dough attachment in your stand mixer), measuring the quantity of water until you reach the desired texture. It should be moist and soft, but not sticky. 4. Knead/Mix the dough for 5 full minutes, and form a ball. 5. Cover the dough with a kitchen towel, and allow it to rest for 15 to 20 minutes. 6. Cut the dough into 8 pieces for burrito-sized tortillas, or 12 pieces for regular small tortillas, and roll the pieces into little balls. 7. Place one of the balls on top of a clean surface, and press down on it lightly with your fingers. 8. Roll out the little ball until you form an oval. Lift up the oval and turn it to the right 45 degrees, and roll it out again. Turn it 45 degrees again to the right until you creat a circle of the desired size (if this makes your head spin, just watch the video). 9. 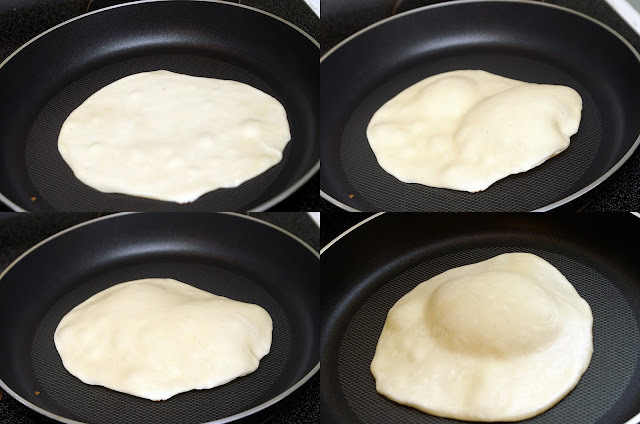 Place the tortilla on a hot comal, griddle pan, or cast-iron skillet until it forms small bubbles on the uncooked side of the tortilla. Play whack-a-mole with the tortilla (push the air out of the bubbles as they pop up). Turn over the tortilla, and wait until it inflates a bit; continue beating the bubbles into submission. 10. Store the tortillas in tortilla holder, covered container, or wrapped in a towel. You could also keep them warm in a low-temperature oven. These tortillas can be reheated the next day; store them in the refrigerator for up to a week. Another excellent post! I've never made tortillas before, but you make it sound very rewarding! Thank you for sharing your experience. Happy Thanksgiving!! Pitas are the best, except when you want a burrito :)! Hope your tortillas ventures are successful :). So glad it's helpful! Thanks for leaving such a kind comment! Hope your tortillas turn out wonderfully :). Hi There! Thanks for the great post with tips. I'm a huge fan of the ol' homemade flour tortilla. I use a Joy of Cooking recipe myself, but it's nearly identical to the one above. nevertheless, I *still* have trouble getting the darn things to bubble up. Sure, I'll get a few quarter-sized bubbles here and there, but not the great big baseball-sized bubbles that make them so tender and light -- even after following all your recommendations to a tee. So the question is this: what is the secret behind the bubbles? I figure that if I understand what makes the bubbles form in the first place I'll be able to figure out where in the process things go south. Any intel would be greatly appreciated. In the meantime, great post! Hi Sophie! Sadly I don't know the science behind it... I just know that the combination of the five tips (although the lard can be replaced with butter) seems to produce great results with tons of air pockets. I do suspect that the temperature of the griddle has something to do with it, because the first one (when the griddle is a bit colder) doesn't bubble as well as the later ones. Hope you have some success! There's few things more rewarding in the kitchen (to me) than a puffy tortilla! I just tried this and I'm so happy I found you tips! I've never made tortillas and they came out (almost) perfect! not perfectly round but oh so tasty! I did a little dance when the first one started to bubble! I'm so happy for you!! It's so exciting (even after dozens of times of making them) when they bubble! I have been trying to make tortillas 3 days in a row now. I can't seem to get them to bubble up! I just am trying to impress my boyfriend. Please help! I'm sorry, Bitty! Without being there with you, it's hard to say what's going wrong. Above all, be sure the heat is the right temperature (medium) and that you've rolled the tortillas VERY thinly. You might also want to make sure that your baking powder is fresh. It's the only leavening agent in tortilla recipes, and if it's old that might be sabotaging your efforts. Good luck and try, try again! Thank you so much for this wonderful post! I live overseas and if I want tortillas, I have to make them myself. I have been trying recipe after recipe with limited success. I've been frustrated... until today when I tried your tips and recipe. The tortillas turned out great with the texture that I've been searching for. I really appreciate your great information. Thanks! Heather, I'm so glad they worked out for you! Thanks so much for taking the time to offer feedback; I really appreciate it! Happy tortilla making :). Your tips have really improved my tortillas! I was following the recipe from the link you provided but something just wasn't working. Sometimes they were good and sometimes they weren't. I think it has to do with the kneading. I ran out of lard and seen you used butter so I tried it.. Amazing! It gave a such a nice taste. Not that it's not great with lard but I like to give them to my kiddos with a bit of butter melted on them since they are always asking for one as I cook them. I do follow her suggestion on adding an extra half tsp of baking powder to make sure it rises. They bubble every time and I can't stop making them! lol. I'm from Mexico but we didn't have these often in the region I grew up in. Your suggestions really helped.. Thanks so much! I just made these last night, and turned out much better than the last recipe I used! I used butter, because that's what I had.They didn't bubble as much as in the video, but they were still pliable (after a few seconds in the microwave) and were tasty. I think I just need practice! The tips are great-I use refined coconut oil for the fat and they turn out fabulous every time. I froze a batch and I think those turned out even better than the newly made batch. Just wanted to say thank you for the tips! I have been trying to get tortillas right for the past year with no success but using your tips they turned out perfect the first time. This made my day, Janet :). I'm so glad it worked for you! I wanted to tell you how much we appreciate this tortilla recipe. Last year my husband found it for me. Now, I have tried making tortillas over the course of our 18 year marriage but it always failed. Yours however, boy oh boy they are so good. And I can actually make them by myself if I have too. So, I thank you with great gratitude. Also, the name of your blog is very memorable. I have had to come back several times to remember the recipe. It is always easy to Google. Thanks again! Thank you so much for your kind comment, Ouida! I'm so very glad they worked out for you :). I'm still working on those elusive corn tortillas; I've had success, but not consistently like with these flour tortillas. Try setting your comal at 475 degree give or take and letting the dough sit coverd for at least an hour you just might get them to bubble.